Not often that I notice stuff and yet, locking my bike, observant old me noticed that the mahoosive pics of wraps and burgers on the mahoosive Tesco were no more. Seems that troubled Mr Tesco is offloading Giraffe -- the neck! -- and replacing its in-house eateries. Return to Mount Eurest, perhaps? Those marketing guys and gals have been locked away for weeks. Eventually their self-appointed leader emerged, crumpled a can of Red Bull, and said "We've got it. We've got the name. We're going to call it ... 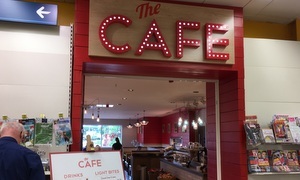 The Cafe." Same Giraffe layout and the exotic prints have been pasted over by huge canvas prints of flat whites and scones. Disappointingly, breakfast is only served until noon leaving light bites (soup, jackets, wraps) and lunch (lasagne, pasta, sausages, burgers), probably more in keeping with the Tesco demographic. Go elsewhere for your poncy San Pellegrino. To be honest, my BBQ chicken panini (with cheeky chips on the side) is OK and let's award five points for the proper Heinz ketchup gracing the table. Adventurous Kev's gone for the goat's cheese flatbread, get him, which he says is tasty if modestly sized. Andy's plate? He's too busy these days, appaz. Quite like the spotty red typography and those M&S-like slabs of carrot cake look appealing. Another day, to be sampled with an as-advertised "hand-crafted coffee". If it was a car -- Honda Accord. If they were passing by -- Ben Miller.